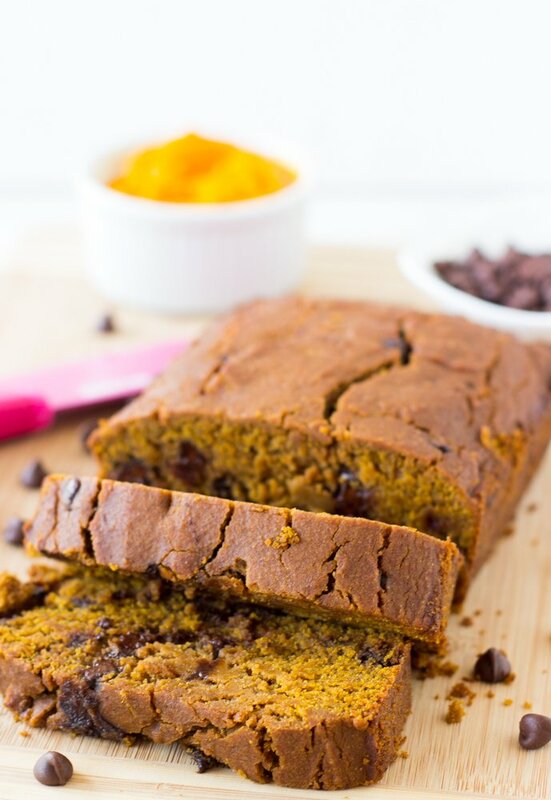 This Healthy Pumpkin Chocolate Chip Bread is made with delicious homemade pumpkin puree, refined sugar free, vegan and gluten free! This bread is soft, decadent AND healthy! It’s September so you know what that means – all things pumpkin! Kidding (not really). Truthfully, pumpkin is something that’s had in my house year-round – it’s always in season so it’s not odd to see us having pumpkin soup in July (let’s just forget about the heat of outside). I’ve grown up loving pumpkin in anything, and so making this pumpkin bread was pretty exciting for me. 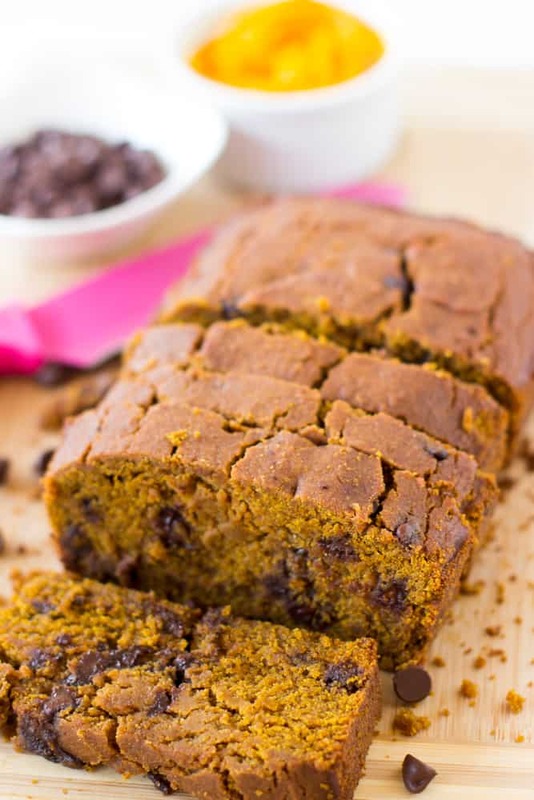 Let me tell you: you’re going to love this healthy pumpkin chocolate chip bread. First things first, it’s actually healthy without tasting healthy (win win) and is SO good! As if the pumpkin bread part itself wasn’t amazing alone, I went and added chocolate chips. Let’s get right into it, shall we? 2) Ensure your oven is working before you start to bake. 3) Maybe 3 years from now I will laugh at this. Maybe. You see, this was the first time I was using my gas stove in over 6 months and maybe the gas had ran out. Folks, a word of advice, use a working oven. You’d think after years of baking, it would occur to me that after the first fail the oven wasn’t anywhere near hot! In fact the thermometer came back at 150 degrees F (if so much). Once the oven glitches were out of the way, the first time I properly baked this vegan pumpkin chocolate chip bread it came out perfectly. I’m kind of glad for the glitches because it made me realise gluten free baking is totally different from regular baking. You need a medium flour and a heavy flour and a starch (the baking powder has cornstarch) to help balance everything out so you have a loaf that is firm and light at the same time. Let’s talk about soft. I was afraid of this bread being dense but it was the opposite – it’s so soft and decadent! 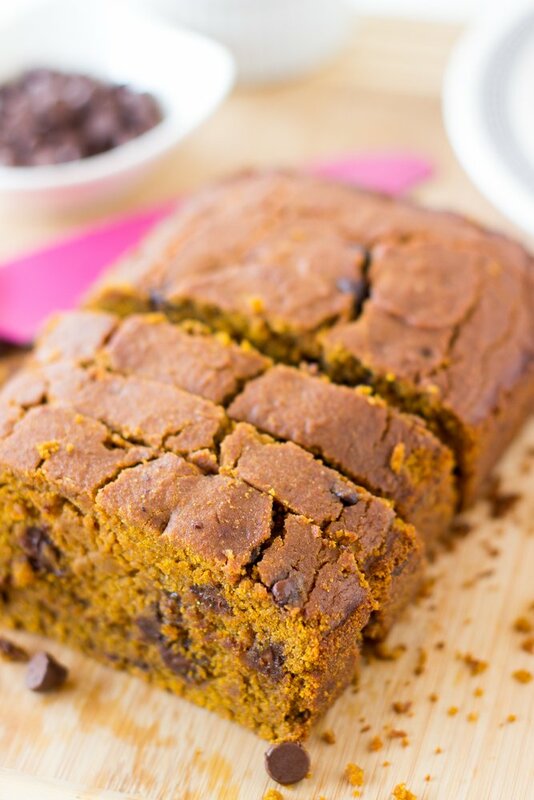 Best part about this healthy pumpkin chocolate chip bread? It doesn’t taste “gluten free” or like anything different was done to it. Everyone in my family approved which is major coming from them. I know I’ll be making this bread again in the upcoming months but I’m thinking probably in the form of muffins. How awesome would those be?! Part of switching to healthier baking is to show you all that you can still get delicious treats that are good for you, without sacrificing taste! Truthfully, you could have this bread for breakfast. At least, I may have had two slices for breakfast. Oops. All in the name of pumpkin, right? Preheat oven to 350 degrees Fahrenheit. Grease a 9 x 5 loaf pan. Add the dry ingredients mix a cup at a time, working into the wet ingredients on a medium to low speed until it's all combined. Don't over mix - up to 2 minutes while using your spatula to scrape down is enough. The mixture won't be thin, and will be a little thick. Stir in the chocolate chips with a spatula. "Pour" batter into the loaf pan. Bake for 45-50 minutes. The loaf is finished when a knife or tester comes out clean (except for maybe some chocolate on it). It’s VERY important to weigh out your flour in gluten free baking so as to get accuracy! Please use a kitchen scale rather than a cup measurement to weight them out – gluten free flours do not weigh as much as gluten flours. 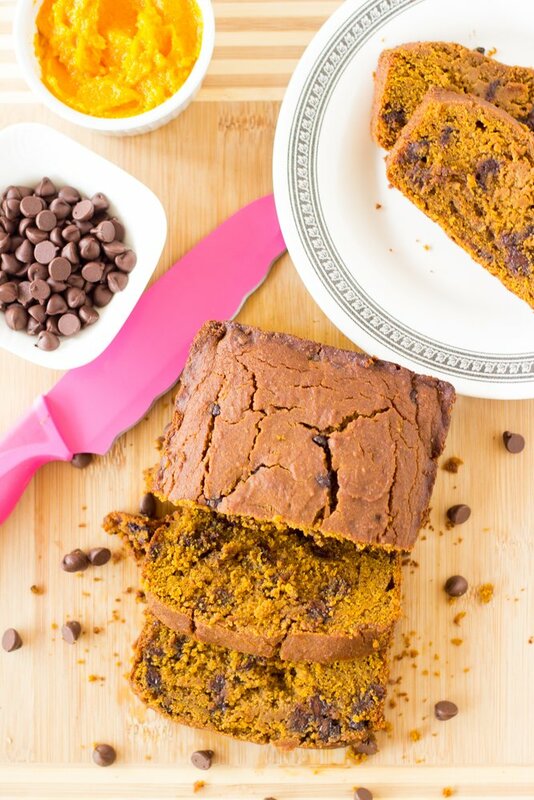 If you try this Healthy Pumpkin Chocolate Chip Bread please let me know in the comment section below, or tag me on instagram with the hashtag #jessicainthekitchen! For more exclusive recipes follow me on Instagram AND on Snapchat: jessinkitchen. HA! Yes, I do think step 1 of baking is to start with a working oven LOL. I wish I could say I haven’t been there, but I have. And one time my parents had a similar experience on Thanksgiving. With a turkey in the very cold oven. Crazy. I’m so glad the loaf turned out in the end. I have to say, it looks gorgeous! Oh GOSH I’m sure that turkey story made for some great jokes at least!! Thanks Joanne 🙂 all’s well that ends well haha. Oh gosh girl this bread doesn’t look once ounce vegan at all. It looks seriously fantastic. A must try! It is definitely Fall time! Kudos on your commitment to this bread. I remember one holiday season when my oven was “going”…it would heat up way low and my food was messed up for weeks! It makes you appreciate when things are in working order. : ) Looking at this has convinced me to give pumpkin bread more attention. Looks great with the chocolate chips! Thanks Monica! Ah oven problems can be so crazy sometimes! yay! fall is here! This looks great Jessica! Your oven reminds me of my oven back in India..nothing would ever bake in that machine lol…beautiful pictures! Lol, Jess, this totally sounds like something that would happen to me! Good thing you figured out it was the oven instead of your amazing baking skills. There’s no way you’d fail at baking something! This loaf looks beautiful. I know people are bemoaning the fact that summer is coming to an end but I say, bring it on! I love fall and I can’t wait for all things pumpkin! I’ve been toying with the idea of going gluten free but I’m so intimidated. You’re making me feel like I could do it and still make yummy baked goods. Aww thanks Nancy! You’re so kind. Haha I am so on bringing on fall too! Don’t be intimidated 🙂 after reading up a bit it really helps! This has made me So excited for pumpkin season. Woah, this is making me hungry right now. This looks seriously fantastic. 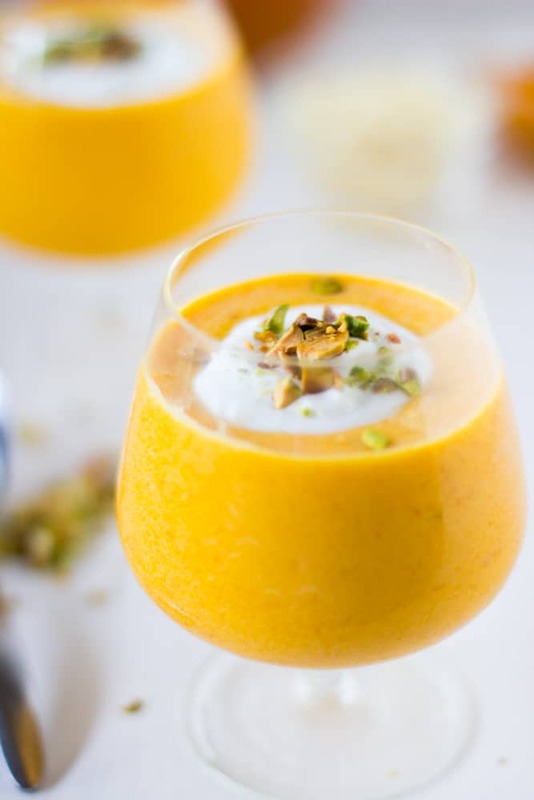 One of the things I love about this time of the year is all the pumpkin recipes I get to drool over including this one. I cant wait tot see the muffins version. Jessica, this has got to be the most gorgeous loaf of pumpkin bread I’ve ever seen! I am loving the addition of chocolate chips (also loving the fact that we BOTH shared pumpkin ‘n’ choc recipes today!) and yes, I think I would eat this entire loaf for breakfast. 😀 Your photos are absolutely gorgeous too, girl! Pinned. Oh my goodness, I can’t believe your oven wasn’t working – what were you using the past 6 months?! I am all about gluten free pumpkin bread since I have a gluten allergy – looks delicious! Haha I have two ovens! I used the gas stove for my bakery 🙂 and finally decided to revive it. Glad you like it Beth! Thanks!! Jessica, it is never too early for pumpkin… and you paired this bread with chocolate! Two of my fav. ingredients! Its beautiful! Way to go on trying gluten free! I haven’t ventured off yet… but am curious! Hehe so glad this bread turned out amazing after the oven glitch 🙂 It looks amazing! 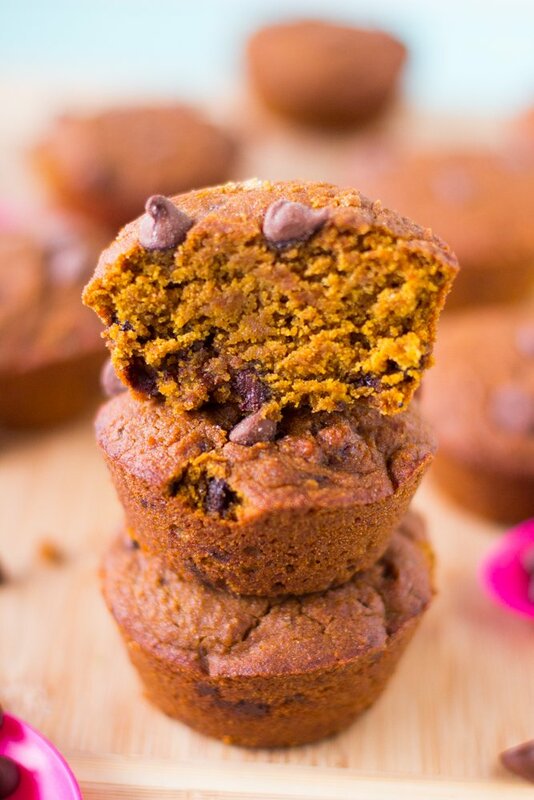 Love pumpkin all year round too and I am so excited that this is gluten free and vegan 🙂 Pinning and can’t wait to try it! It looks just gorgeous and so delish! I looove that you made it GF. I am a little scared to try gluten free myself, seems so scientific, LOL! You definitely succeeded much to the gluten free lovers delight! Glad you figured out it was your oven! and chocolate chips are always welcome in my book! this looks fabulous. . 3 times a charm! YUM Jessica and look at the crusty exterior on that bread and then all moist on the inside. YEs please! Love pumpkin season! Ha! Yes a working oven would help when baking 🙂 That’s too funny – and totally something I would do! This bread looks delish! I haven’t really started baking with pumpkin yet but I have busted out the apples! Yay fall! If I have an all purpose gluten free mix flour, how much would you think I would use for this recipe? I can’t be 100% sure but I would say the same amount in weight using a kitchen scale so 10 ounces. I am trying more vegan, but I’m not gluten free. Can I use my regular whole wheat pastry flour? Will this work as mini muffins? Yes it will. I made them as muffins but for mini you’d have to adjust the time greatly probably to about 8-12 minutes and keep an eye on it. They do have a pumpkin taste but they definitely taste like sweet muffins! Awesome!! Thanks for letting me know Julia and I’m so glad that it turned out well! Just baked this tonight, and I was a little nervous because the mixture was VERY thick. I added a little more coconut milk, and the mix was still more like dough. HOWEVER, I just had a piece and it was absolutely delicious!! A little toasty on the outside and moist on the inside. I love it. It’s on the crumbly side, but it’s still super good. Thanks so much for the recipe! So glad you enjoyed it Arica!! Thanks for the feedback :). Pumpkin Chocolate. never thought they went together. gonna try it and let you know. A nice recipe! Thank you!!! You’re so welcome! And thanks for the conversions!! can i make this into bundt cake instead of bread????? I haven’t tried that, and it isn’t a very solid bread so I’m not sure you should. If you do try it I would love to know!